One of the more common requirements from radio stations is needing to mix live audio feeds during automated playout. Typically this could be a hourly national news bulletin, delivered via a satellite. In America many radio stations combine both locally automated programmes and a satellite programme. In most of these cases, expensive audio switching equipment is required. This accepts the audio from a satellite receiver and is controlled via GPI or RS232 by the Automation Software. Autoplus now allows you to switching soundcard inputs to any available output. You could send your satellite news feed to a spare soundcard input, then tell Autoplus to switch this to any of the soundcard outputs at specified times. 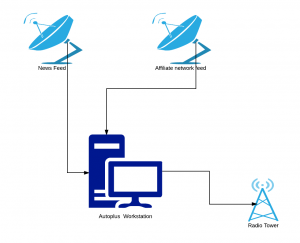 This allows radio stations to achieve advanced switching of audio feeds during automated programming sequences without buying expensive switching and matrix hardware.